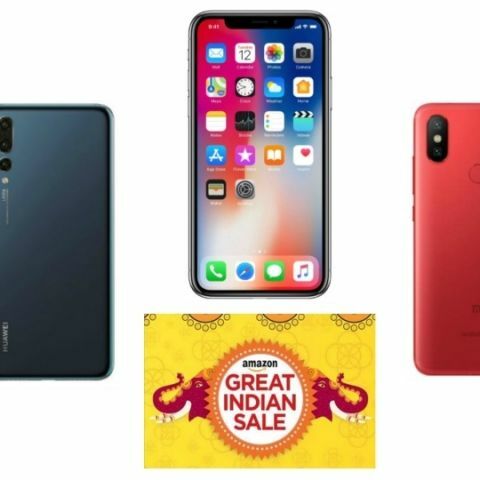 The Amazon Great Indian Festival Sale is in its last leg today and this just might be the final opportunity for buyers to purchase some smartphones like the Apple iPhone X, Xiaomi Mi A2, Huawei P20 Pro and others at a discounted price. Apple’s iPhone X launched last year with a price tag of Rs 91,900. Now, the phone is available at a discounted price of Rs 74,999 on the Amazon Great Indian Festival Sale. If you have an SBI debit or credit card then you will get a 10% instant discount while making a payment through a bank’s card. Not just that, Amazon is also giving a one-time free screen replacement on this purchase. View deal here. If you’re not willing to spend a lot of money on a device like the iPhone X, then the iPhone 6 is still a good option to go with. The phone is available on the sale at Rs 18,999. You can get this device for as low as Rs 16,099 during the Great Indian Festival Sale. View deal here. The Huawei P20 Pro is the first smartphone that was launched with a triple-rear camera setup. The phone was introduced in the Indian market at a price of Rs 64,999. On the sale, the device is priced at Rs 54,999. Amazon will also give a one-time free screen replacement that is worth up to Rs 18,000 as well as a no-cost EMI option during the sale. View deal here. The Xiaomi Mi A2 is also available at a discount during the Great Indian Festival Sale. The device is available on the platform with a flat Rs 2,000 discount, bringing its price down to Rs 14,999. With an additional 10% cashback, buyers can get their hands on this device for as low as Rs 12,999. View deal here. The Samsung Galaxy S9, which was recently launched in India at Rs 61,900, is available at a discount. The 128GB variant of the Galaxy S9 is available at Rs 44,990 on the Great Indian Festival sale, while the 256GB variant is priced at Rs 48,990. Amazon is also giving up to an Rs 18,990 on exchange. View deal here. If you’re a fan of the Samsung Note series then the Samsung Galaxy Note 8 offer might interest you more than the Galaxy S9. The smartphone 6GB/64GB variant is now available at a price of Rs 43,999 down from its MRP of Rs 67,900. As mentioned earlier as well, buyers will get a 10% instant discount when using SBI debit/credit card along with an extra 10% cashback on orders above Rs 6,000. View deal here. The Xiaomi Redmi 6 Pro is available on the sale at Rs 10,999 along with an instant discount from SBI of Rs 1,000 (appx). For those who are still not aware of the device specifications, it has a 5.84-inch full HD+ display with a resolution of 2280 x 1080 pixels. The smartphone is powered by a Qualcomm Snapdragon 625 octa-core processor, which is paired with a 3GB RAM and 32GB memory. View deal here. The Vivo V9 Pro is available on sale for Rs 17,990, with a flat Rs 2,000 discount along with an SBI instant cashback of Rs 1,799. On this purchase, buyers also have an option of no-cost EMI that starts at Rs 2,998 per month. Moreover, you can also get a 10% bonus cash back if you purchase the smartphone today on sale. View deal here. The Honor Play is available on the Great Indian Festival Sale at a discounted price of Rs 18,999. On SBI card transactions, you can get up to a Rs 1,899 cashback. One can also opt for no cost EMI option that starts at Rs 2,111 per month. The device is powered by a Kirin 970 octa-core processor and has a 6.3-inch full HD+ display. View deal here. The Huawei’s Honor 7X is priced at Rs 9,999 during the Great Indian Festival Sale. The smartphone was launched in India at Rs 13,999. It is powered by a Kirin 659 octa-core processor, which is paired with 4GB RAM and 64GB internal memory. View deal here. The Moto G6, which comes with a dual-rear camera setup is now available on its lowest price till date during this sale, at Rs 11,999. One can purchase this device for as low as Rs 10,000 (appx). Buyers will also get a free screen replacement with the phone. View deal here. The Moto E5 Plus was launched at Rs 12,999, and is now priced at a Rs 9,999 during the Great Indian Festival Sale. With SBI 10% discount, buyers can grab this device for Rs 11,700. View deal here. The Huawei P20 Lite is available for Rs 15,999 on the sale. Buyers who will purchase this device today will get an extra cashback of 10% along with a 10% instant discount on using SBI debit/credit card. View deal here. The Xiaomi Redmi Y2 is on a discount of a Rs 1,000 during the Amazon Great Indian Festival Sale, which brought down the effective price of the device to Rs 9,999. One can get this device for as low as Rs 6,999 (appx), which includes SBI 10% instant discount and an additional 10% cashback from Amazon. View deal here.